If you are looking for Gennady Timchenko (second from right), the dominant Russian in the partnership which created the oil trader Gunvor, you won’t find him in the market prospectus Gunvor has just released to the market. That’s because the document, dated May 10, 2013, spells his name Guennadi Timtchenko. The prospectus for $500 million in bonds is the first to be issued to the market by the hitherto secretive Timchenko and his partner, Torbjorn Tornqvist. Prepared by Credit Suisse, Goldman Sachs, ING and Societe Generale, the document says Timchenko and Tornqvist own the group 50/50. But the prospectus isn’t a prospectus in Switzerland because in that country, Gunvor can “not claim to comply with the disclosure standards of the Swiss Federal Code of Obligations and the listing rules of the SIX Swiss Exchange Ltd. and corresponding prospectus schemes annexed to the listing rules of the SIX Swiss Exchange Ltd.” The prospectus can be read in full here. According to press reports, Gunvor’s debt sale was initially targeted to raise $300 million. The prospectus acknowledges that the arranging banks may rig the sale “with a view to supporting the market price of the Notes at a level higher than that which might otherwise prevail.” Expert opinion in the London market differs about the genuine demand. The Financial Times claims, without identifying a source, that the issue was “significantly oversubscribed” and that $500 million in debt notes were sold, instead of $300 million. In January, Bloomberg was told by Tornqvist that the bond sale target was $500 million. “The market is good for this right now,” he was reported as saying. “We are actually planning to construct a couple of refineries around the world and we are looking for investment opportunities outside Russia as well.” By April, however, weakening market demand had cut the target to $300 million, as Reuters was told by Gunvor’s chief operating officer, Jerome Schurink. One disclosure conspicuous by its absence in Gunvor’s prospectus relates to its business in the central African Republic of Congo-Brazzaville. There, between 2010 and 2012, Gunvor secured eighteen cargoes for trade of 920,000 tonnes of Congolese crude, worth $115 million each, making more than $2 billion altogether. According to sources reported in Geneva, the terms included a discount of $4 per barrel, which, allegedly, turned into a benefit of about $72 million. Swiss government investigators have been examining the evidence of the trade and of allegations of bribes, kickbacks, and money laundering. The wrongdoing, according to press reports of the investigation, involved the President of Congo, Denis Sassou Nguesso, who met with Timchenko and Tornqvist in 2009. According to Gunvor, which confirmed the presidential meeting to the Swiss newspaper Le Temps, such meetings are standard practice during the negotiation of big contracts between an oil trading company and a government. The Congolese president has subsequently visited President Vladimir Putin in Moscow, and the two governments are negotiating arms deals, as well as a pipeline to be built across Congo by Stroitransgas, a company owned by Timchenko. For more on that story, read this. On the other hand, in a one-line mention in the auditor notes to the annual financial statement, it is revealed that “Gunvor Petroleum Congo SAU of Congo”, a 100% owned subsidiary, is “in liquidation” (page F-146). Reports from PA Resources indicate that Gunvor is now the largest shareholder in the company, and that the current oil production rate is 6,600 barrels per day. Of that, 4,700 bd come from Azurite and Aseng, counted together. Exactly how much Congo crude PA Resources produces and Gunvor trades is not clear. PA Resources documents claim the Congolese well flow is variable and unstable. It is almost certainly a small fraction of the Congolese oil trade which has been under investigation in Geneva. As for meeting President Putin’s policy to reduce or eliminate the “offshorization” of major Russian companies, Gunvor reports that in addition to the holding parent, registered in Cyprus, there are forty “principal subsidiaries”. Of those just three are registered in Russia – Rosneftebunker, which supplies fuel for ships at Ust-Luga; Nevskaya Pipe Company, which connects the Baltic Pipeline System from oilfields in the hinterland to the Ust-Luga tanker terminal; and Gunvor OOO, reported as in the business of “services”. Cyprus dominates the registrations of the majority of other “principal” subsidiaries, followed by Switzerland. 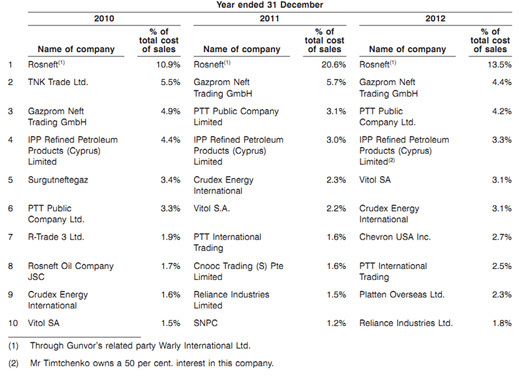 As for companies controlled by Timchenko, with which Gunvor buys and sells things of value, these are not named. But in a section of auditor’s notes dealing with related-party transactions, it is reported that in 2011 the Gunvor group sold $10,348 worth of goods and services, and bought $20.5 million worth of the same from “entities under common control”. The transactions are reported to have been “on normal commercial terms and conditions”.